"Give me back such days as those, with the old good cheer, the old stage coaches and the gabled inns and the warm red wine, the snapdragon and the Christmas-tree, and I'll believe again in Christmas, yes, in Father Christmas himself." "MY DEAR Young Friend," said Father Time, as he laid his hand gently upon my shoulder, "you are entirely wrong." Then I looked up over my shoulder from the table at which I was sitting and I saw him. But I had known, or felt, for at least the last half-hour that he as standing somewhere near me. You have had, I do not doubt, good reader, more than once that strange uncanny feeling that there is some one unseen standing beside you, in a darkened room, let us say, with a dying fire, when the night has grown late, and the October wind sounds low outside, and when, through the thin curtain that we call Reality, the Unseen World starts for a moment clear upon our dreaming sense. You have had it? Yes, I know you have. Never mind telling me about it. Stop. I don't want to hear about that strange presentiment you had the night your Aunt Eliza broke her leg. Don't let's bother with your experience. I want to tell mine. "You are quite mistaken, my dear young friend," repeated Father Time, "quite wrong." "Young friend?" I said, my mind, as one's mind is apt to in such a case, running to an unimportant detail. "Why do you call me young?" "Your pardon," he answered gently — he had a gentle way with him, had Father Time. "The fault is in my failing eyes. I took you at first sight for something under a hundred." "Under a hundred?" I expostulated. "Well, I should think so!" "Your pardon again," said Time, "the fault is in my failing memory. I forgot. You seldom pass that nowadays, do you? Your life is very short of late." I heard him breathe a wistful hollow sigh. Very ancient and dim he seemed as he stood beside me. But I did not turn to look upon him. I had no need to. I knew his form, in the inner and clearer sight of things, as well as every human being knows by innate instinct, the Unseen face and form of Father Time. I could hear him murmuring beside me, "Short — short, your life is short"; till the sound of it seemed to mingle with the measured ticking of a clock somewhere in the silent house. Then I remembered what he had said. "How do you know that I am wrong?" I asked. "And how can you tell what I was thinking?" "You, said it out loud," answered Father Time. "But it wouldn't have mattered, anyway. You said that Christmas was all played out and done with." "Yes," I admitted, "that's what I said." "And what makes you think that?" he questioned, stooping, so it seemed to me, still further over my shoulder. "Why," I answered, "the trouble is this. I've been sitting here for hours, sitting till goodness only knows how far into the night, trying to think out something to write for a Christmas story. And it won't go. It can't be done — not in these awful days." "Yes. You see, Father Time," I explained, glad with a foolish little vanity of my trade to be able to tell him something that I thought enlightening, "all the Christmas stuff — stories and jokes and pictures — is all done, you know, in October." I thought it would have surprised him, but I was mistaken. "Dear me," he said, "not till October! What a rush! How well I remember in Ancient Egypt — as I think you call it — seeing them getting out their Christmas things, all cut in hieroglyphics, always two or three years ahead." "Two or three years!" I exclaimed. "Pooh," said Time, "that was nothing. Why in Babylon they used to get their Christmas jokes ready — all baked in clay — a whole Solar eclipse ahead of Christmas. They said, I think, that the public preferred them so." "Egypt?" I said. "Babylon? But surely, Father Time, there was no Christmas in those days. I thought ——"
"My dear boy," he interrupted gravely, "don't you know that there has always been Christmas?" I was silent. Father Time had moved across the room and stood beside the fireplace, leaning on the mantelpiece. The little wreaths of smoke from the fading fire seemed to mingle with his shadowy outline. "Well," he said presently, "what is it that is wrong with Christmas?" "Why," I answered, "all the romance, the joy, the beauty of it has gone, crushed and killed by the greed of commerce and the horrors of war. I am not, as you thought I was, a hundred years old, but I can conjure up, as anybody can, a picture of Christmas in the good old days of a hundred years ago: the quaint old-fashioned houses, standing deep among the evergreens, with the light twinkling from the windows on the snow; the warmth and comfort within; the great fire roaring on the hearth; the merry guests grouped about its blaze and the little children with their eyes dancing in the Christmas fire- light, waiting for Father Christmas in his fine mummery of red and white and cotton wool to hand the presents from the yule-tide tree. I can see it," I added, "as if it were yesterday." "It was but yesterday," said Father Time, and his voice seemed to soften with the memory of bygone years. "I remember it well." "Ah," I continued, "that was Christmas indeed. Give me back such days as those, with the old good cheer, the old stage coaches and the gabled inns and the warm red wine, the snapdragon and the Christmas-tree, and I'll believe again in Christmas, yes, in Father Christmas himself." "Believe in him?" said Time quietly. "You may well do that. He happens to be standing outside in the street at this moment." "Outside?" I exclaimed. "Why don't he come in?" "He's afraid to," said Father Time. "He's frightened and he daren't come in unless you ask him. May I call him in?" I signified assent, and Father Time went to the window for a moment and beckoned into the darkened street. Then I heard footsteps, clumsy and hesitant they seemed, upon the stairs. And in a moment a figure stood framed in the doorway — the figure of Father Christmas. He stood shuffling his feet, a timid, apologetic look upon his face. I had known in my mind's eye, from childhood up, the face and form of Father Christmas as well as that of Old Time himself. Everybody knows, or once knew him — a jolly little rounded man, with a great muffler wound about him, a packet of toys upon his back and with such merry, twinkling eyes and rosy cheeks as are only given by the touch of the driving snow and the rude fun of the North Wind. Why, there was once a time, not yet so long ago, when the very sound of his sleigh-bells sent the blood running warm to the heart. All draggled with the mud and rain he stood, as if no house had sheltered him these three years past. His old red Jersey was tattered in a dozen places, his muffler frayed and ravelled. The bundle of toys that he dragged with him in a net seemed wet and worn till the cardboard boxes gaped asunder. There were boxes among them, I vow, that he must have been carrying these three past years. But most of all I noted the change that had come over the face of Father Christmas. The old brave look of cheery confidence was gone. The smile that had beamed responsive to the laughing eyes of countless children around unnumbered Christmas- trees was there no more. And in the place of it there showed a look of timid apology, of apprehensiveness, as of one who has asked in vain the warmth and shelter of a human home — such a look as the harsh cruelty of this world has stamped upon the faces of its outcasts. 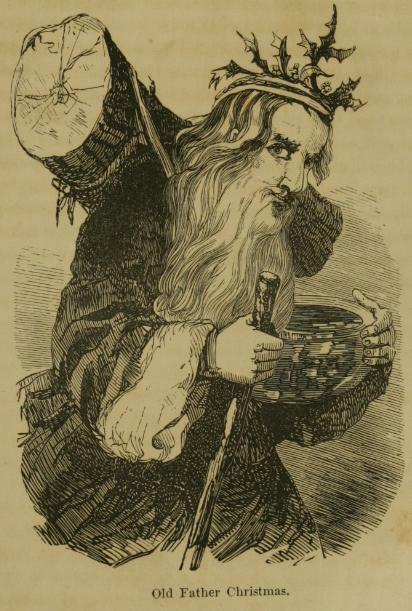 So stood Father Christmas shuffling upon the threshold, fumbling his poor tattered hat in his hand. "Shall I come in?" he said, his eyes appealingly on Father Time. "Come," said Time. He turned to speak to me, "Your room is dark. Turn up the lights. He's used to light, bright light and plenty of it. The dark has frightened him these three years past." I turned up the lights and the bright glare revealed all the more cruelly the tattered figure before us. Father Christmas advanced a timid step across the floor. Then he paused, as if in sudden fear. "Is this floor mined?" he said. "No, no," said Time soothingly. And to me he added in a murmured whisper, "He's afraid. He was blown up in a mine in No Man's Land between the trenches at Christmas-time in 1914. It broke his nerve." "May I put my toys on that machine gun?" asked Father Christmas timidly. "It will help to keep them dry." "It is not a machine gun," said Time gently. "See, it is only a pile of books upon the sofa." And to me he whispered, "They turned a machine gun on him in the streets of Warsaw. He thinks he sees them everywhere since then." "It's all right, Father Christmas," I said, speaking as cheerily as I could, while I rose and stirred the fire into a blaze. "There are no machine guns here and there are no mines. This is but the house of a poor writer." "Ah," said Father Christmas, lowering his tattered hat still further and attempting something of a humble bow, "a writer? Are you Hans Andersen, perhaps?" "But a great writer, I do not doubt," said the old man, with a humble courtesy that he had learned, it well may be, centuries ago in the yule-tide season of his northern home. "The world owes much to its great books. I carry some of the greatest with me always. I have them here ——"
He began fumbling among the limp and tattered packages that he carried. "Look! The House that Jack Built — a marvellous, deep thing, sir — and this, The Babes in the Wood. Will you take it, sir? A poor present, but a present still — not so long ago I gave them in thousands every Christmas-time. None seem to want them now." He looked appealingly towards Father Time, as the weak may look towards the strong, for help and guidance. "None want them now," he repeated, and I could see the tears start in his eyes. "Why is it so? Has the world forgotten its sympathy with the lost children wandering in the wood?" "All the world," I heard Time murmur with a sigh, "is wandering in the wood." But out loud he spoke to Father Christmas in cheery admonition, "Tut, tut, good Christmas," he said, "you must cheer up. Here, sit in this chair the biggest one; so — beside the fire. Let us stir it to a blaze; more wood, that's better. And listen, good old Friend, to the wind outside — almost a Christmas wind, is it not? Merry and boisterous enough, for all the evil times it stirs among." Old Christmas seated himself beside the fire, his hands outstretched towards the flames. Something of his old-time cheeriness seemed to flicker across his features as he warmed himself at the blaze. "That's better," he murmured. "I was cold, sir, cold, chilled to the bone. Of old I never felt it so; no matter what the wind, the world seemed warm about me. Why is it not so now?" "You see," said Time, speaking low in a whisper for my ear alone, "how sunk and broken he is? Will you not help?" "Gladly," I answered, "if I can." "All can," said Father Time, "every one of us." Meantime Christmas had turned towards me a questioning eye, in which, however, there seemed to revive some little gleam of merriment. "Have you, perhaps," he asked half timidly, "schnapps?" "Ay, schnapps. A glass of it to drink your health might warm my heart again, I think." "Ah," I said, "something to drink?" "His one failing," whispered Time, "if it is one. Forgive it him. He was used to it for centuries. Give it him if you have it." "I keep a little in the house," I said reluctantly perhaps, "in case of illness." "Tut, tut," said Father Time, as something as near as could be to a smile passed over his shadowy face. "In case of illness! They used to say that in ancient Babylon. Here, let me pour it for him. Drink, Father Christmas, drink! " Marvellous it was to see the old man smack his lips as he drank his glass of liquor neat after the fashion of old Norway. Marvellous, too, to see the way in which, with the warmth of the fire and the generous glow of the spirits, his face changed and brightened till the old-time cheerfulness beamed again upon it. He looked about him, as it were, with a new and growing interest. "A pleasant room," he said. "And what better, sir, than the wind without and a brave fire within!" Then his eye fell upon the mantelpiece, where lay among the litter of books and pipes a little toy horse. "Ah," said Father Christmas almost gayly, "children in the house!" "One," I answered, "the sweetest boy in all the world." "I'll be bound he is!" said Father Christmas and he broke now into a merry laugh that did one's heart good to hear. "They all are! Lord bless me! The number that I have seen, and each and every one — and quite right too — the sweetest child in all the world. And how old, do you say? Two and a half all but two months except a week? The very sweetest age of all, I'll bet you say, eh, what? They all do!" And the old man broke again into such a jolly chuckling of laughter that his snow-white locks shook upon his head. "But stop a bit," he added. "This horse is broken. Tut, tut, a hind leg nearly off. This won't do!" He had the toy in his lap in a moment, mending it. It was wonderful to see, for all his age, how deft his fingers were. "Time," he said, and it was amusing to note that his voice had assumed almost an authoritative tone, "reach me that piece of string. That's right. Here, hold your finger across the knot. There! Now, then, a bit of beeswax. What? No beeswax? Tut, tut, how ill-supplied your houses are to-day. How can you mend toys, sir, without beeswax? Still, it will stand up now." I tried to murmur by best thanks. But Father Christmas waved my gratitude aside. "Nonsense," he said, "that's nothing. That's my life. Perhaps the little boy would like a book too. I have them here in the packet. Here, sir, Jack and the Bean Stalk, most profound thing. I read it to myself often still. How damp it is! Pray, sir, will you let me dry my books before your fire?" "Only too willingly," I said. "How wet and torn they are!" Father Christmas had risen from his chair and was fumbling among his tattered packages, taking from them his children's books, all limp and draggled from the rain and wind. "All wet and torn!" he murmured, and his voice sank again into sadness. "I have carried them these three years past. Look! These were for little children in Belgium and in Serbia, Can I get them to them, think you?" Time gently shook his head. "But presently, perhaps," said Father Christmas, "if I dry and mend them. Look, some of them were inscribed already! This one, see you, was written 'With father's love.' Why has it never come to him? Is it rain or tears upon the page?" He stood bowed over his little books, his hands trembling as he turned the pages. Then he looked up, the old fear upon his face again. "That sound!" he said. "Listen I It is guns — I hear them." "No" no," I said, "it is nothing. Only a car passing in the street below." "Listen," he said. "Hear that again — voices crying!" "No, no," I answered, "not voices, only the night wind among the trees." "My children's voices!" he exclaimed. "I hear them everywhere — they come to me in every wind — and I see them as I wander in the night and storm — my children — torn and dying in the trenches — beaten into the ground — I hear them crying from the hospitals — each one to me, still as I knew him once, a little child. Time, Time," he cried, reaching out his arms in appeal, "give me back my children!" "They do not die in vain," Time murmured gently. "Give me back my children! " Then he sank down upon his pile of books and toys, his head buried in his arms. "You see," said Time, "his heart is breaking, and will you not help him if you can?" "Only too gladly," I replied. "But what is there to do?" "This," said Father Time, "listen." He stood before me grave and solemn, a shadowy figure but half seen though he was close beside me. The fire-light had died down, and through the curtained windows there came already the first dim brightening of dawn. "The world that once you knew," said Father Time, "seems broken and destroyed about you. You must not let them know — the children. The cruelty and the horror and the hate that racks the world to-day — keep it from them. Some day he will know" — here Time pointed to the prostrate form of Father Christmas — "that his children, that once were, have not died in vain: that from their sacrifice shall come a nobler, better world for all to live in, a world where countless happy children shall hold bright their memory for ever. But for the children of To-day, save and spare them all you can from the evil hate and horror of the war. Later they will know and understand. Not yet. Give them. back their Merry Christmas and its kind thoughts, and its Christmas charity, till later on there shall be with it again Peace upon Earth Good Will towards Men." His voice ceased. It seemed to vanish, as it were, in the sighing of the wind. I looked up. 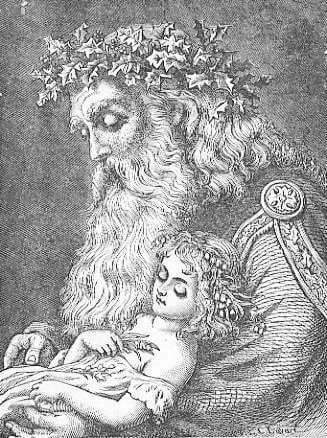 Father Time and Christmas had vanished from the room. The fire was low and the day was breaking visibly outside. "Let us begin," I murmured. "I will mend this broken horse." Merry Christmas is a featured selection in our collection of Christmas Stories. Add Merry Christmas to your own personal library.